This certificate documents the ISO calibration of your measuring instrument. Calibration is carried out at the following measuring points: O2: 2.5 vol%, CO: 100 ppm, CO: 1000 ppm, NO: 800 ppm, NO2: 100 ppm, SO2: 1000 ppm. 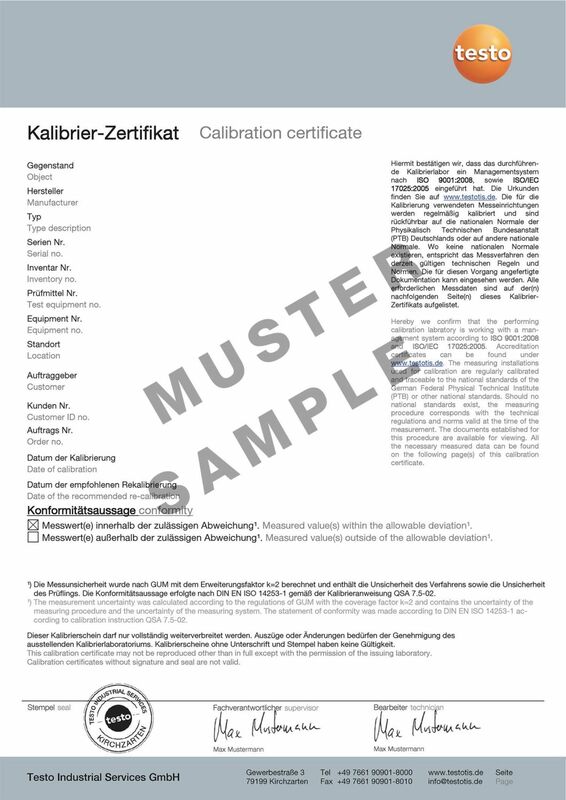 This certificate documents the ISO calibration of your data logger or transmitter. Calibration is carried out at selectable measuring points within the range -196 to +1200 °C (external probes), -40 to +180 °C (internal probes). The DAkkS calibration of your data logger is documented in this certificate. Calibration is carried out at the -50 °C, 0 °C, +90 °C, +121 °C and +140 °C measuring points. Accuracy 0.1 to 0.6 % of f.v. Accuracy > 0.6 % of f.v. This certificate documents the ISO calibration of your data logger or transmitter. Calibration is carried out at the measuring points -18 °C, 5 °C and +65 °C. This certificate documents the ISO calibration of your clamp meter. Calibration is carried out within the range 0 to 20 / 200 A. 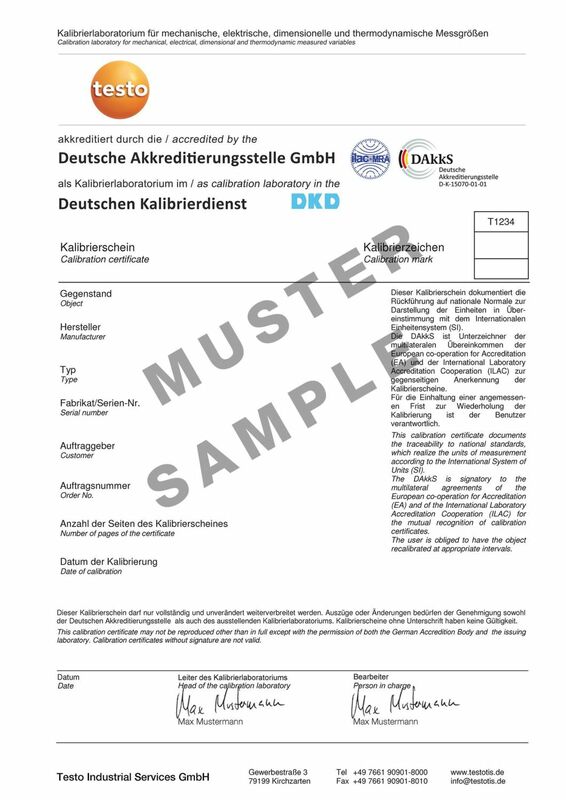 This certificate documents the DAkkS calibration of your clamp meter. Calibration is carried out within the range 0 to 20 / 200 A. This certificate documents the ISO calibration of your measuring instrument/probe. Calibration is carried out at selectable measuring points within the range 0; 50 to 10,000 lx.